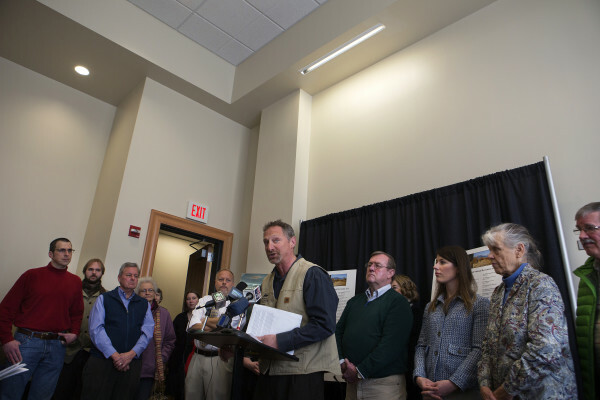 Rob Lilieholm, forest economist at the University of Maine, speaks about why he supports the proposal of a national park and national recreation area east of Baxter State Park Thursday during a press conference at the Cross Insurance Center Meeting Room #3 in Bangor. 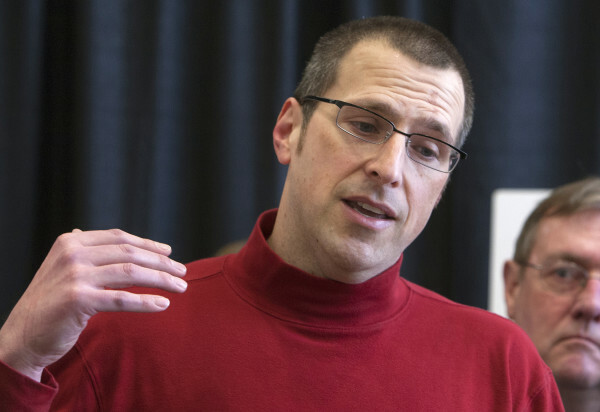 Chris Dalton, owner of Syncopation, a software company in Bangor, speaks to why he supports the proposal of a national park and national recreation area east of Baxter State Park Thursday during a press conference at the Cross Insurance Center Meeting Room #3 in Bangor. 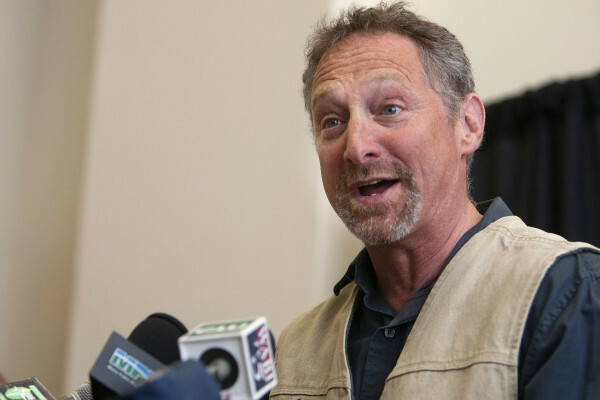 Matt Polstein, owner of New England Outdoor Center on Millinocket Lake, speaks to why he supports the proposal of a national park and national recreation area east of Baxter State Park Thursday during a press conference at the Cross Insurance Center Meeting Room #3 in Bangor. Matt Polstein (center), owner of New England Outdoor Center on Millinocket Lake, speaks to why he supports the proposal of a national park and national recreation area east of Baxter State Park Thursday during a press conference at the Cross Insurance Center Meeting Room #3 in Bangor. 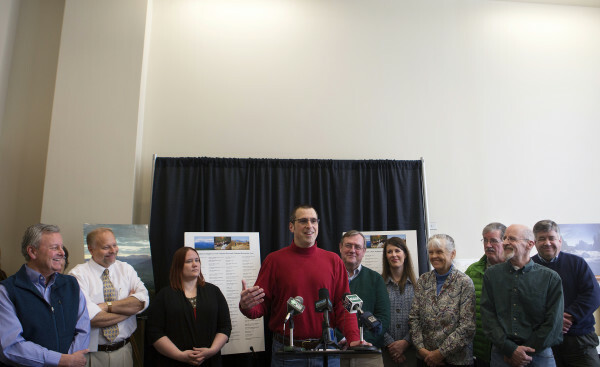 BANGOR, Maine — More than 200 businesses from around the state endorsed a proposed 150,000-acre national park and recreation area in the Katahdin region Thursday. The endorsement, which included a letter signed by all the businesses to Maine’s congressional delegation urging the creation of the park, is the latest public approval of the controversial gift to the nation first proposed by entrepreneur Roxanne Quimby in 2011. Now an initiative fronted by her son, Lucas St. Clair, the 75,000-acre park and 75,000-acre recreation area would go on family land east of Baxter State Park. The Bangor City Council voted 7-2 Monday to support the concept. It joined the Katahdin Area and Greater Houlton chambers of commerce, Maine Innkeepers Association, Town of Medway and the East Millinocket Board of Selectmen with endorsements registered since Millinocket officials said in February that U.S. Angus King, I-Maine, sought a letter from them listing their issues with the park plan. Millinocket Town Councilors Jimmy Busque, Bryant Davis and Gilda Stratton blasted the Bangor council’s endorsement during a regular Millinocket council meeting Thursday afternoon. They said that Bangor was interfering with Millinocket’s right to handle its own business. Councilor Anita Mueller, who supports the park, said she felt Bangor’s council was speaking for itself. “I think it was a lack of respect, decorum. Just overall I found it very unprofessional,” Councilor Michael Madore said, adding that his council would not get involved with Bangor’s problems. “I have never seen a town get involved with another town’s business like this,” Busque said. Bangor, Madore said, is about 88 miles from the proposed park area, while Millinocket is about 11, making the park proposal Millinocket’s business, not Bangor’s. Millinocket’s council opted earlier this month to oppose the park. The federal delegation, Gov. Paul LePage and the state Legislature opted against Quimby’s proposal. The Penobscot County Commissioners opposed the plan in 2011 and was divided by St. Clair’s updated proposal, which the Maine Snowmobile Association and several sporting and forest products industry groups continue to oppose. Bangor City Councilor Sean Faircloth, who helped engineer the 7-2 vote, dismissed Madore’s complaint. If distance is a factor in political involvement, then the Millinocket council “should defer to Medway’s endorsement because Medway is seven miles closer” than Millinocket to the proposed park area, said Faircloth, who attended the press conference. Rob Lilieholm, a University of Maine economist whose study of the economic impact of the national park estimated it could create 450 to 1,000 jobs, said that Bangor has made many investments through the years that have benefited northern Maine. Ryder counted among those investments Bangor International Airport, the Cross Insurance Center, about $63 million in Penobscot River restoration and $200 million in public and private investment in the Bangor-Brewer area that includes services used by all Penobscot County. If the park is created, Bangor would be one corner of a triangle between the park and Acadia National Park through which most park visitors would have to pass via the airport or Interstate 95, which makes the park Bangor’s business, Ryder said. 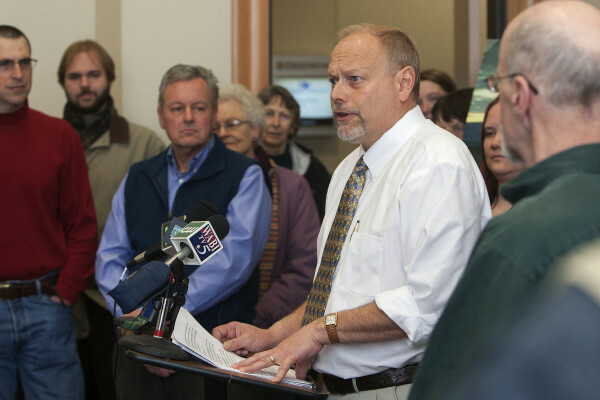 “This is an issue for all of northern Maine,” Faircloth said.